"Hi - I teach cooking classes in Sacramento and Elk Grove & have been featured in Sacramento Magazine and on Channel 3 and Channel 13 newscasts. I use the Garlic Twist in my classes. My students love it & I am interested in purchasing a supply to make available to them. Is this possible & if so what is the minimum # and cost?" "Hi there: just a line to say that I finally got around to reading the Sacramento Bee article re your Garlic Twist. Went out to William Glen's and purchased 3 and simply love it. You are the Greatest! While I was there I met a few other people who love to cook and had purchased one also. I definitely will spread the word around. Thanks for your great invention." "We were in Yacats, WA for Thanksgiving and there was a little kitchen store that had your garlic twist. I thought they looked like a good invention and the owner of the store sure liked them. She had sold out though and didn't get her order in before we left. What is your price for 6 or 12?" "I was in need of a new garlic press since my old one was getting rather nasty looking with rust. I had my husband look for one and he came home with the Garlic Twist. We had to try it out right away. What an awesome gadget! I don't think I will ever use a press again." "Had to drive over 30 mi to buy two "Garlic Twist" (one for myself and one for daughter)...will I EVER be able to find these "great 'lil things" in my Elk Grove area so I can buy them as gifts???? I called all over, locally, and nobody seemed to know what I was talking about... is it possible to get a senior discount by purchasing 6 or 12 of them???? A lot can be said for large families - but - the "why didn't you get ME one?" is tough!!!" "The Garlic Twist works exactly as promised -- unusual for any gadget!!! So very easy to clean too! 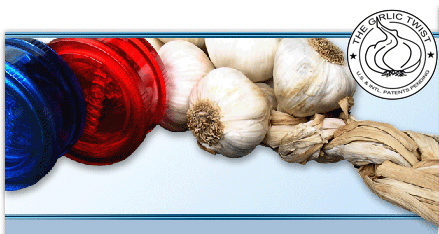 I have been a minced-garlic-from-a-jar user in the past, but now I'm a fresh garlic user. Thanks to you, the inventor, and my brother, Mike, for sending me one." "My brother-in-law just showed me your wonderful Garlic Twist. Can you tell me where I can purchase one? I live in Yuba City, 45 minutes north of Sacramento, CA. (Webmaster's note: Listen to me, you need a new brother-in-law.) "
"We got the Twist on Saturday. What a neat little gadget! I had so wanted to buy a garlic press and I'm glad I didn't buy one." "We sent a couple of the Garlic Twists to our sons living in New Zealand. Now we have to buy more for their friends, and their friends’ friends!!!"